Alex Azar’s heart bleeds for the poor suffering people of Idaho who just want to go back to the wonder years before Obamacare. Last month the Republican leadership of Idaho pursued a very innovative approach to lowering health insurance premiums for young and health people: just blatantly violating the Affordable Care Act to let insurers discriminate against older and sicker people. Earlier this month, in response to complaints about rising health insurance premiums and as an alternative to Medicaid expansion, [Governor Butch] Otter signed an executive order instructing his state insurance agency to let insurers issue individual policies that did not comply with ACA requirements for essential health benefits or nondiscrimination on the basis of age or preexisting conditions. Now, said agency has made it official: Insurers can offer bare-bones policies that violate all sorts of Obamacare provisions, including price discrimination against sick people and caps on pay-outs. Health care experts wondered right away what the Department of Health and Human Services would have to say about that, particularly after Blue Cross of Idaho hastened to take advantage of the state’s permission slip by offering one of these bare-bones plans. As it turns out, the Feds tried pretty hard to look the other way. 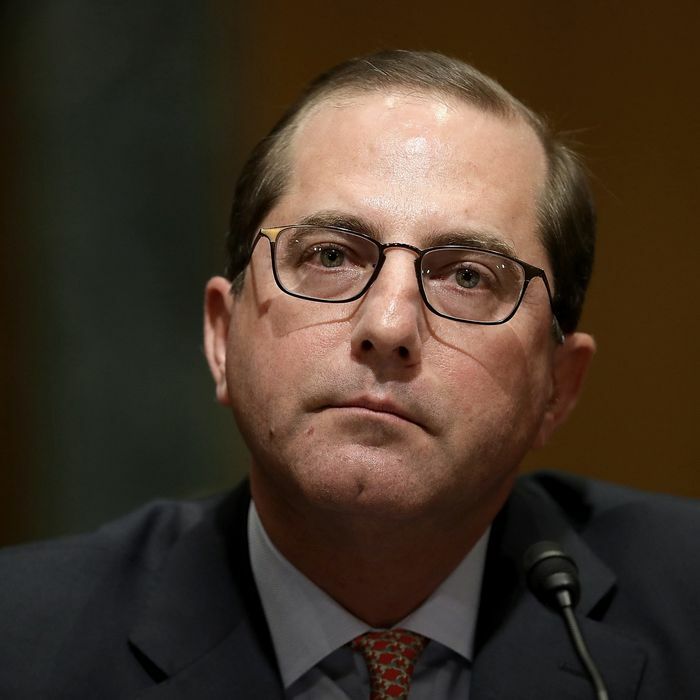 Asked about Idaho’s scofflaw attitude by Senator Ron Wyden in a hearing at the Senate Finance Committee, HHS Secretary Alex Azar at first tried to suggest that Idaho’s action wasn’t official. Asked by Wyden how he would respond to Idaho’s actions, Azar said he had not yet seen a waiver request or other plan from the state. “I can assure you that if we do receive that … we’ll be looking at that very carefully and measuring it up against the standards of the law, as is our duty,” he said. Wyden then clarified that Idaho does not appear to be asking for a waiver. “Idaho’s just saying, ‘We’re going to do this,’ ” said Wyden. He then pressed Azar to outline HHS planned response to Idaho actions within the next 10 days. And seeing Azar’s reluctance, [he] proposed a 30-day deadline. Caps are back: These new “freedom” plans have annual limits of $1 million in benefits, which are outlawed under the ACA; there are also specific dollar caps for certain services, such as physical therapy. And so naturally, the people who couldn’t medically qualify for these plans would be left in their Obamacare ghetto, with skyrocketing premiums. Azar cannot, of course, just wave a wand and let Idaho violate — indeed, in effect nullify — the law. Lawsuits will be brought, and judges whose hearts are less likely to bleed for the plight of Idahoans who have to subsidize the health insurance of the poor and sick and elderly may be less forgiving. But Azar’s reluctance to step in remains remarkable in an allegedly law-and-order administration.